Far from the glitzy bank buildings and boutiques in Luxembourg city sits a run-down prefab building behind the railway station that shows another side to Europe’s richest country. The tiny grand duchy nestled between France, Belgium and Germany has for more than 10 years played host to a busy “shooting gallery” to give drug addicts a safe space to inject narcotics. “Here in Luxembourg there are around 2,000 users of hard drugs. For a country with 600,000 people, that’s a lot,” says Patrick Klein, director of the Abrigado “shooting gallery”. 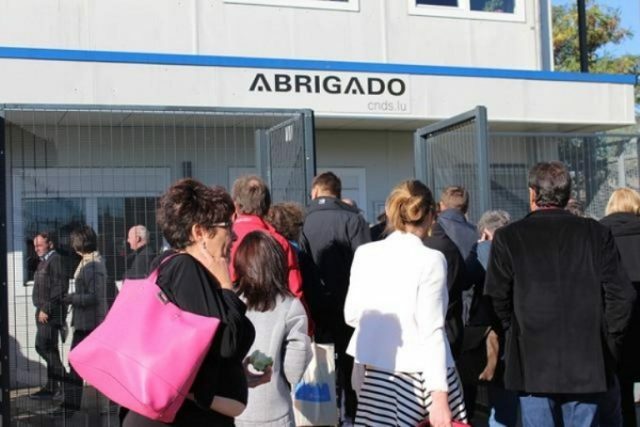 Abrigado — which means “sheltered” in Portuguese, a nod to the fact that the historic home of Luxembourg’s largest immigrant community is nearby — opened in 2005. It now boasts a consumption room, a day centre with a medical service, and a night shelter with 42 beds. The money to run it comes from a 2.7 million euro a year budget financed by the Luxembourg health ministry and the city of Luxembourg. Between 2011 and 2016, the last year for which figures were available, usage doubled to more than 57,000 annual visits to consume drugs, which works out at more than 156 a day. “It’s going well. The chances of catching something are minimised, they’ve done that well,” says drug user Patrick Steffen, 54. Needle exchanges — swapping dirty needs for sterilised ones — rose by 25 percent in 2016, and is now “nearly 100 percent,” explains Luxembourg health minister Lydia Mutsch. This is a big step forward in a country where intravenous drug use has become the third biggest mode of transmission of AIDS. “Here there is a family spirit,” says another user, Thierry Yavo, 41, from France. But Abrigado chief Klein says the shelter is “reaching its limits in terms of welcoming capacity” during the seven hours a day that it is open. The question is why Luxembourg — which has the highest gross domestic product per head of population in the 28-nation European Union — has so many drug addicts. Klein blames “social tourism” enabled by Europe’s open borders policy, with a number coming from France. He also noted that at Abrigado the proportion of addicts from countries from EU countries that used to be part of the Soviet bloc has grown, and now represents 20 percent of all users. Klein however rejects claims that Abrigado itself attracts more drug users, a common criticism of shooting galleries when they have been set up in other countries such as Switzerland and France. “In our centre, the average length of time that people have been drug users is 12 years,” he says. But for the German national — who has advised the French health minister and worked in a Parisian shooting gallery called Gaia — there is only one number which counts. “Our key figure is zero. Zero deaths from drug overdoses in our institution,” says Klein. He attributes that to the daily presence of a nurse, along with visits by a doctor three times a week. In 2016 there were 69 drug overdoses, 29 of whom lost consciousness, says Abrigado’s annual report. In the shooting gallery users have to give their identity and sign a users contract. They also have to promise to obey the centre’s rules, while there is a week-long exclusion rule for those who flaunt the regulations. It also works in full cooperation with the authorities. “There is also a deal with the cops, so that users can consume here without the risk of police coming and arresting us while we’re using, so we lose our dose,” says Jean-Charles, a 46-year-old drug user. Luxembourg’s government has now decided to put two million euros towards the construction of a second shooting gallery, which will open at the end of 2018 in Esch-sur-Alzette, a southern town near the French border. “We are going to take everything that is good about the current centre, and if there are things that can be improved, we will do it in collaboration with the Abrigado team,” says Jean-Nico Pierre, head of the foundation that will run the second shelter. As for the risk of “social tourism” that comes from having the centre next to a border in the Schengen passport-free zone, he is stoical.